Easy meets creamy in this simple oven-baked mac and cheese recipe. 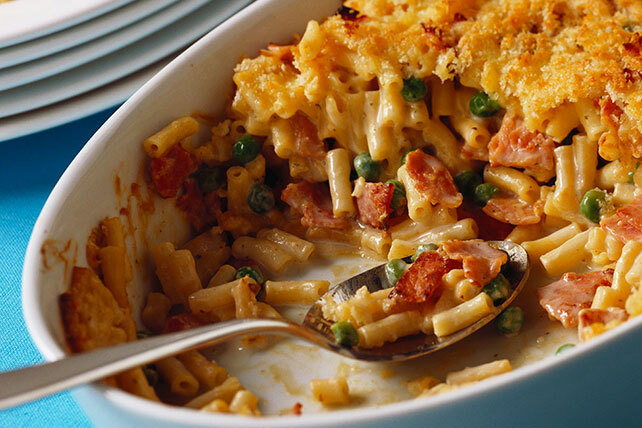 Enjoy bacon, peas and a crumb topping over macaroni and cheese, ready in a flash. Prepare Kraft Dinner as directed on package. Add peas, cheddar cheese, milk and bacon; stir until combined. Spoon into a 2-L baking dish. Mix bread crumbs and Parmesan in small bowl in small bowl. Sprinkle over pasta mixture. Bake 25 min. or until topping is lightly browned. Try this recipe with frozen corn niblets in place of peas.